DIFFERENTIAL BRAIN EFFECTS OF LASER AND NEEDLE ACUPUNCTURE AT LR8 USING FUNCTIONAL MRI. Home Artigos CientíficosDIFFERENTIAL BRAIN EFFECTS OF LASER AND NEEDLE ACUPUNCTURE AT LR8 USING FUNCTIONAL MRI. 1. Acupunct Med. 2013 Sep;31(3):282-9. doi: 10.1136/acupmed-2012-010297. Epub 2013 Aug 6. Quah-Smith I(1), Williams MA, Lundeberg T, Suo C, Sachdev P.
(1)School of Psychiatry, University of New South Wales and Neuropsychiatric Institute NPI, Prince of Wales Hospital, Sydney, New South Wales, Australia. OBJECTIVE: While needle acupuncture is a well-accepted technique, laser acupuncture is being increasingly used in clinical practice. The differential effects of the two techniques are of interest. We examine this in relation to brain effects of activation of LR8, a putative acupuncture point for depression, using functional MRI (fMRI). METHODS: Sixteen healthy participants were randomised to receive low intensity laser acupuncture to LR8 on one side and needle acupuncture to the contralateral LR8. Stimulation was in an on-off block design and brain patterns were recorded under fMRI. RESULTS: Significant activation occurred in the left precuneus during laser acupuncture compared with needle acupuncture and significant activation occurred in the left precentral gyrus during needle acupuncture compared with laser acupuncture. CONCLUSIONS: Laser and needle acupuncture at LR8 in healthy participants produced different brain patterns. Laser acupuncture activated the precuneus relevant to mood in the posterior default mode network while needle acupuncture activated the parietal cortical region associated with the primary motor cortex. Further investigations are warranted to evaluate the clinical relevance of these effects. 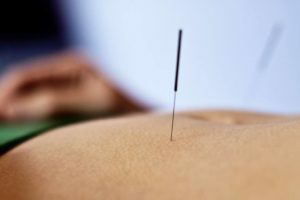 Estudo: A Acupuntura atinge o mesmo eixo biológico em ratos que fármacos em seres humanos.